Saturday I ran my 3rd half marathon! 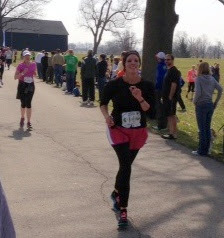 It was Run the Bluegrass, at the beautiful Keeneland, in Lexingon, KY. This was by far the most challenging and hilly course I've ever run! My wonderful man brought me, it was about 35 degrees and very foggy! They delayed the start by 15 minutes because of the fog and there was construction going on, so a lot of people were still stuck in traffic. I think that was great, I felt so bad for all the people who would've missed it! Back to those hills... they were INSANE! Over 30 hills, nonstop. Mile 9 was the worst. It was a steep incline, then curved, then steep incline, and curved again. As I looked around, every single person was walking it, including me. For most of the hills, I tried to run a little bit of them. I just looked down and ran, until I couldn't run anymore, then I would just walk. But the views and sights were SO beautiful! Gorgeous rolling hills, horses, beautiful houses, etc. As I was rounding a corner, I saw these horses just running and running along with us. It was amazing! Thankfully once the sun came out, it warmed up into the 40's, and was perfect running weather. I really felt good throughout the whole race. There were a lot of water/gatorade stops. They were also handing out power bars along the course. (I'm not sure who could eat a power bar while running though!) I brought along my GU's, which always help me. The hills were challenging, but I love challenging! I love that feeling of 'I can't do this', but pushing myself anyway, and discovering that I can do anything!! This was an awesome race, they took such great care of the runners. I was happy to see all of these at the finish line! As well as chocolate milk and Glier's Goetta, which was...interesting! I also found out that this year's race theme was Genuine Risk, which was the filly that won the 1980 KY Derby. So the ribbon on our medal was the filly's silks! (Last year's theme was Secretariat.) I thought that was so cool! But I am positive that if this had been a 'regular' course, I would've PR'd. My honey took this pic of me coming into the finish! This was a crazy, awesome race and I can't wait to do it again next year!! SOOOOOO proud of you! :) That's insane with all the hills! When I'm running a huge hill, the term "hurts so good" comes into my mind! I am so glad that you pushed hard and had fun! You look AMAZING! You inspire me. That's exactly it- hurts so good!! I have been waiting for you to post!!! I wanted to hear so bad about this race, I see it is as rough as everyone said it was!!! But the views I bet was breathtaking!!! Are you doing the Derby half? Congrats for finishing, I think that is an accomplishment all on its own!!! I'm not planning on doing the derby half, unless I win free registration. I'm entering a drawing at 12, I'm praying I win!! Thanks, girl! yay! Looks like a super fun- and super challenging race!! Love me some hills, but boy, they KILL!! :) GREAT JOB!!! Thanks, Elizabeth! They sure do kill- my legs are still sore, 3 days later! 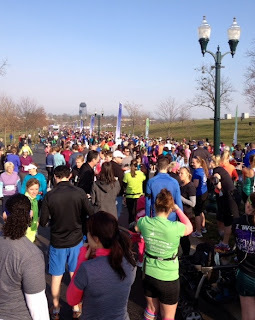 I am contemplating starting to train for half-marathon in the fall and I am super nervous about it...your story is inspiring and what an awesome race to run! Oh Carly, do it! You will not regret it. The 1/2 is my favorite distance to run. I haven't ran my full yet, but I'm sure that won't change even then. I think you'll love it! Great job! That course sounds really tough, but you did an amazing job! Nice job! Love the bling and it looked like a beautiful day for running! Thanks, girl! It was a perfect day! Very inspiring!! Great job pushing through those hills!! Great work on what looks to have been a very awesome day!! Thank you, Pam! They sure do make you stronger. I think I need to do them more often! Great job! 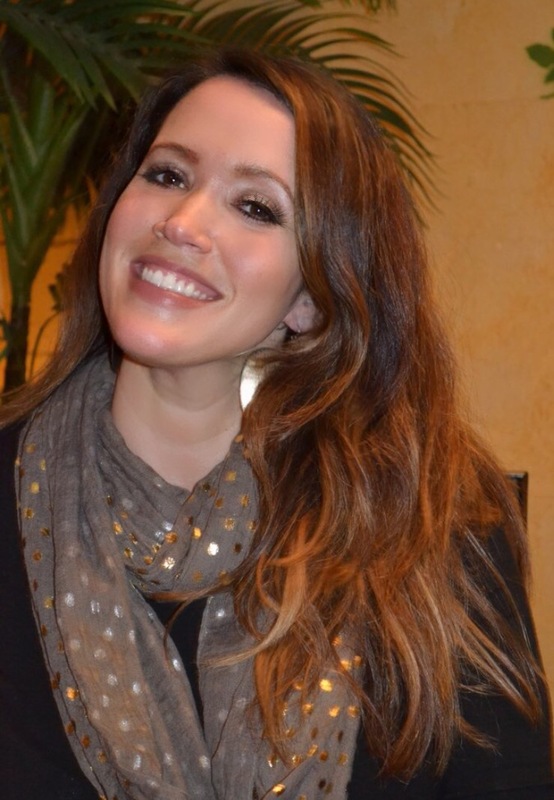 Beautiful as ever!!! Congrats on a great race. 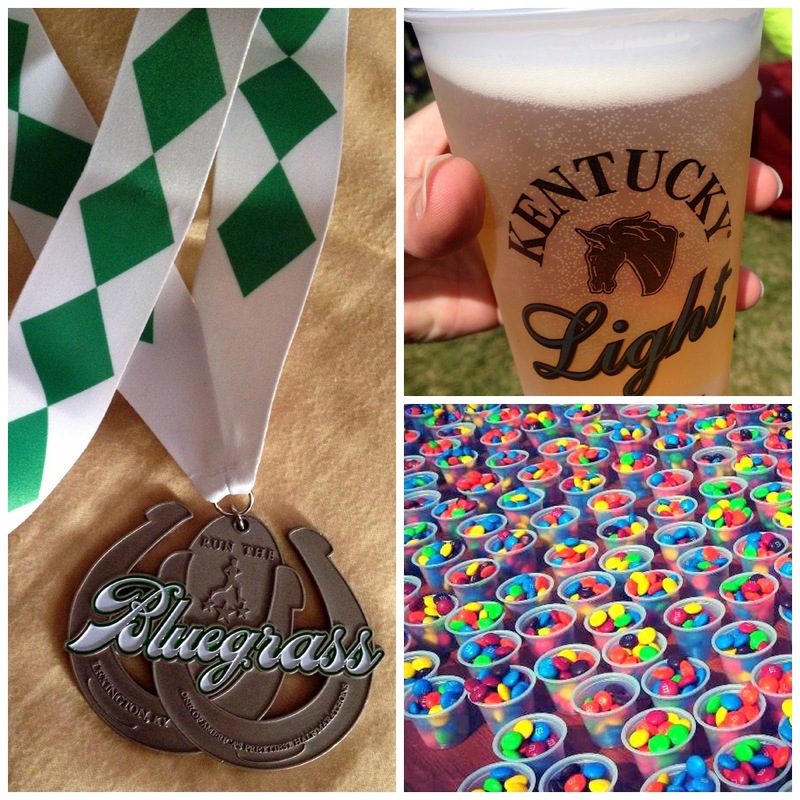 Cool medals and beer to boot! Oh my gosh those hills look brutal. I am so proud of your time on such a tough course. Thank you, Abby. They were definitely brutal! Love your blog!! Sounds like a fun race. Love the bling!! Good luck on your full! Beautiful course, insane looking incline map, congrats to you for conquering it! Thank you, May! It was totally insane, but I loved it! Congrats!! I did that race last year and it is TOUGH isn't it?? That hill at mile 9 had me walking as well. It seemed like it just would never end. HAHAHA. But the course is so pretty. I think it's such a great race, glad they kept it local and not a RNR ! Thanks, Coy! It was very tough! But it sure was a great race. I'm so glad they kept it local too. When I heard it was going to be RNR, I was so disappointed. So I'm very glad they changed it back! Thanks, Brittany! YES, that would be awesome!! Good job! Your next half will seem easy!! Thanks, Lorenda. I'm sure that will be true! You did amazing on this race, Katie!! That elevation chart looks like someone was having a heart attack. Way to eat up the hills. Thanks, Gina! Now that you mention it, it does look that way! Lol! Love reading your blog, my runner kids also ran this race and my SIL for his first half! Hopefully you can meet my group of runner next year, Congrats!! Thank you so much! I would love to meet your runner kids! Thanks, Sydney! I'm so excited you're running your first 1/2 this month! I can't wait to hear about it! What a great race! Hills are so tough, but you did it and had FUN! That's the best :) Congrats! That is an insane elevation chart! Great job, Katie! You ran a really solid time for such a challenging course. Looks so beautiful, too! Thanks, Laura. That means a lot coming from you! It was a gorgeous course! Great job and wonderful photos! Love your blog :) It's fun to see how many of us write race reports and all the things we have in common from the race. Best of luck and thanks for stopping by my blog too. Congrats on a wonderful race! I've heard this is a beautiful but hilly race. It's on my list for next year hopefully. Thanks, Suz! Would love to run this with you next year too! Hi Kattie! 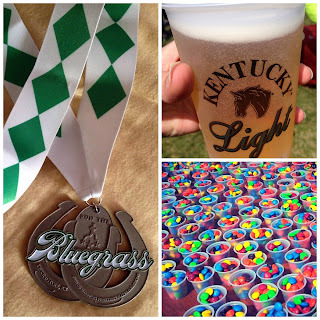 Congratulations on your journey and running the Bluegrass! I too was there. Just curious... did you wear a Garmin or know the total ascent/elevation gain (not net elevation gain)? The elevation map from the organization does not adequately depict the hills nor does it calculate the TOTAL elevation climb (I think they say 300 feet, but no way is that correct). Congrats on you running it too! Did you see the very first pic I posted of the elevation? That was from my Runkeeper app. Is that what you're talking about? I heard it was over 30 hills! My Garmin isn't working, so wasn't wearing one.